Your computer is running too slow. So you check Task Manager and notice that your disk usage is stuck at 100%. What can you do to fix it? This problem is more common than you may think. It can be caused by a number of issues. Instead of ignoring the problem, try these fixes to get your Windows 10 PC running just like it did when it was new. Many of the following fixes for 100% disk usage issue in Windows 10 are relevant to Windows 7, 8, 10, & Vista as well. However some commands and system settings may vary. There are many reasons your disk usage may stay pegged at 100%. Because of this, there's no one-solution-fits-all. A bit of troubleshooting is required to narrow down the issue. Luckily, there are some very common causes for this problem. You can identify the issue affecting your computer by trying these solutions one at a time and testing whether it resolves your 100% disk usage issue. Starting with Windows 8.1, Microsoft included a diagnostics tracking tool with its operating system called DiagTrack. The goal of the service was to collect data about your PC and anonymously send it to Microsoft so that the company could improve its Windows product. This runs as a service in the background (learn more about Windows Services). In many cases this data collection service can write to disk constantly. Here's how you can check if this is causing your problem. Click the Windows Start menu, type Services and click Services tool. Find Connected User Experiences and Telemetry in the list of services. This is the name of the DiagTrack service. Right click on the service and select Properties. Click Stop (upper left, looks like a link) to stop the service. Press Ctrl+Alt+Del, click Task Manager, and make sure the Processes tab is selected. Check whether the Disk column has dropped from 100% disk usage. If disk usage hasn't dropped, click Start (upper right, looks like a link) to restart the service. Skip this step and move on to the next section. If it has, that means Diagtrack is the problem. Back in the service properties window, change Startup type to Disabled, and click OK. The Windows Index service isn't a new feature in Windows 10. It's been around since Windows 2000 (at the time it was called Content Search). The Index service scans your computer regularly and tries to identify new files or file changes on your disk drive. The service stores these changes in a special index so that when you search for files in Windows Explorer, results can be provided faster. Problems can arise with the indexing service, leading to issues with 100% disk usage in Windows 10. When searching for the service to stop and disable, search for the Windows Search service in the list. Disabling the Windows Search service may resolve your disk utilization problem, but it also means searches in Windows Explorer will take much longer. This issue arises from a bug in Windows Search, and Microsoft patches various bugs frequently. Try running a Windows Update to see if it resolves this problem without the need to disable Windows Search (skip to the Windows Update section to learn more). SuperFetch is a feature introduced as far back as Windows 2000. Its purpose is to run in the background and constantly analyze your RAM usage to identify apps that you run most often. It then attempts to preload thos apps into memory before you need them. Issues arise because SuperFetch is always running, and it regularly writes data from your hard drive to RAM. SuperFetch is often the culprit when you notice the 100% disk usage issue whenever you restart your computer. When searching for the service to stop and disable, search for the SuperFetch service in the list. If the SuperFetch service won't stop, you can disable it in the Registry. Click the Start button, search for Regedit and open it. Navigate to HKEY_LOCAL_MACHINE / SYSTEM / CurrentControlSet / Control / Session Manager / MemoryManagement / PrefetchParameters. Double click the EnableSuperfetch parameter, and change the value to 0. Click OK. Restart your computer to ensure SuperFetch is disabled. As you use Windows, an integrated app running in the background will attempt to issue tips and suggestions as a notification. While this is the least likely issue causing your 100% disk usage utilization error, it is just one more app running in the background that can cause problems for some users. Try turning off Windows Tips and see if it improves your system performance. Click Start, type notifications, and click on Notifications & Actions Settings. In this window, disable Get tips, tricks, and suggestions as you use Windows. If you're running Skype for Desktop on any version of Windows before Windows 10, Skype could be causing your disk usage issue. This is because if Skype doesn't have permissions to write data to one of its subfolders in Program Files (x86), it'll continue trying to write and ramp up your hard drive usage. On Windows 10, you can install the Skype app from the Microsoft Store. This solution will not work on this version of Skype. If you still suspect Skype, open the Windows 10 Add or remove programs tool, click Skype and click Advanced Options. Click Terminate to terminate Skype and its processes. Open Windows Explorer, and navigate to the C:\Program Files (x86)\Skype\Phone\ directory. Right click Skype.exe. Click ALL APPLICATION PACKAGES, and select the Write checkbox under Allow. Click OK. 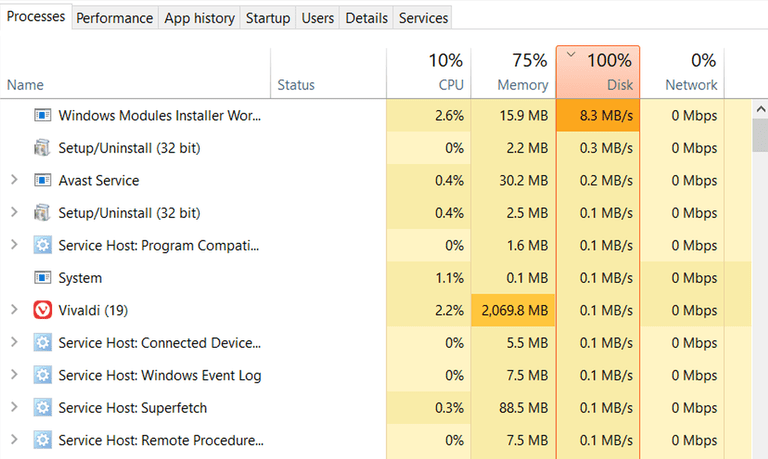 If this doesn't resolve your disk usage issue, try uninstalling Skype entirely. This will at least confirm whether or not Skype is causing the issue. There are a few features in Chrome that are meant to speed up your browsing experience. One of those services is a prediction service in Chrome that tries to analyze what site you're likely to visit, and preload those pages in the background. Unfortunately, this service also puts an extra load on your computer and the hard drive. To see if disabling this service resolves your hard drive issue, work through the following steps. Click on the three dots near your profile image, and click on Settings. Scroll to the bottom of this page, and click Advanced. In the Privacy and security section, disable Use a prediction service to load pages more quickly. Scroll down to the System section, and disable Continue running background apps when Google Chrome is closed. In Firefox, you can disable prefetching by visiting about:config in the address bar, and setting the network.prefetch-next value to false. In Edge, go to Settings, scroll down to View advanced settings, and turn off Use page prediction to speed up browsing, improve reading, and make my overall experience better. There is a default Microsoft driver that comes with the Windows operating system, which allows your computer to communicate with SATA devices (like hard drives). Microsoft acknowledges a known bug with some Advanced Host Controller Interface PCI-Express models on Windows 10. If your computer is affected, you'd experience 100% disk usage problems. No worries! According to Microsoft, there's an easy fix. First, check that your computer has the AHCI driver. Clicking on Start, typing device manager and clicking on Device Manager. Drop down IDE ATA/ATAPI in the list, right click SATA AHCI Controller, and click Properties. Click on the Driver tab, and click Driver Details. If you see "C:\Windows\system32\DRIVERS\storahci.sys" in the Drivers files field, then your PC could be susceptible to this known bug. If you've discovered that you have the storahci.sys driver file on your system, the following steps will help you fix the problem if this known bug is causing your hard drive issues. Click on the Details tab and click Device instance path from the drop down list. Copy the value there and paste it into a text editor (like Notepad). and expand the folder of the value you've saved into your text editor. Inside this folder, navigate to Device Parameters\Interrupt Management\MessageSignaledInterruptProperties, double click on MSISupported, and change its value to 0. Editing inside the registry can be dangerous. Changing the wrong value can cause your system to become unstable. To be safe, take a backup of the registry by clicking on File, Export, and saving the .reg backup file to a folder or external hard drive. Give Virtual Memory a Rest: Buy More RAM! Many tech experts will tell you that to resolve hard drive usage problems cost by your computer's excessive use of virtual memory, you should tweak virtual memory settings. In fact, many gamers tweak their virtual memory settings to try and boost their PC performance. The problem with this is that if you set the pagefile setting too low and run too many applications, those programs can crash. If you set the pagefile space too large, whenever your insufficient RAM is used up the computer will resort to accessing the hard drive even more. Leave the pagefile setting alone, and instead order additional RAM memory cards for your computer and extend your computer's available memory to as much as possible. This one single change will have the biggest impact on resolving disk usage problems you may be having. Frequently many users is that the disk drive starts running at 100% for no reason at all, right in the middle of when they're trying to do important work. A common cause of this is Windows Updates taking place at random times, automatically. There are two options you can take to prevent this from happening. One option is to turn off automatic windows updates and run it manually when it's more convenient. To do this, click Start, type windows updates, and click Windows Update settings. Click Advanced options, and make sure Automatically download updates is turned off. Another option is to block Windows Updates from running when you're most likely to be using your computer. To do this, in the Windows Update settings screen, click Change active hours. Set the Start time and the End time to the time period when you usually use your computer. If you do disable automatic Windows Updates, make sure to run manual updates frequently. This will ensure you receive important security updates that keep your computer safe from viruses and malware. If all else fails, there's a good chance you could have a virus or malware. The best thing to do at this point is to make sure you have good antivirus software, and run a full system scan. A full scan can take a long time, but it'll find and remove any malicious software that might be running on your system and spiking the disk usage. It can't hurt to do several or all of the options listed above. Even if it isn't the source of your problem, each tweak will optimize your system for peak disk performance. This issue can be annoying, but once you isolate and fix the problem, your 100% disk usage issue will disappear and you can enjoy a fast, well-functioning computer again.